Banks lent like crazy in January. But why? The fight for deposits looks ever fiercer, and growth in a narrow measure of money supply was the lowest on record. Add in poor economic signs, and the explanation seems to be that productive lending has given way to extending. China’s financial system added 2.6 trillion yuan ($426 billion) of new financing in January 2014, an all-time high and above consensus estimates. Of that, 51 percent was yuan-denominated bank loans, while 20 percent came from loans made by trust vehicles, a kind of non-bank financing entity, and loans between companies, known as “entrusted loans”. 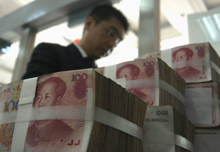 Separate data showed that 816 billion yuan were medium and long-term loans, the highest amount since January 2010. Deposit outflows were 940 billion yuan, driven partly by corporate and fiscal outflows of 2.8 trillion yuan ahead of the Chinese New Year. Growth in M1, a narrow measure of money supply that includes cash and demand deposits from companies, was just 1.2 percent, the lowest on record according to Thomson Datastream. The official Purchasing Manager’s Index, a survey that shows what a selection of companies think about China’s growth prospects, fell to a six-month low for January, data showed on Feb. 1. The employment part of the index fell to an eleven-month low. The Breakingviews China Tea Leaf Index, an alternative measure of China’s growth prospects, fell to 91.1 in January’s reading, from 93.4 the previous month.